Stockholm 2014: enormous dressmaker's pins seem to puncture the seat of this sofa by Hungarian design student Demeter Fogarasi, pushing through to form legs on the underside. The Pinsofa by Demeter Fogarasi features wooden poles protruding at angles from the top and bottom of a plywood platform, which is upholstered with two layers of foam and covered with fabric donated by Danish firm Kvadrat. 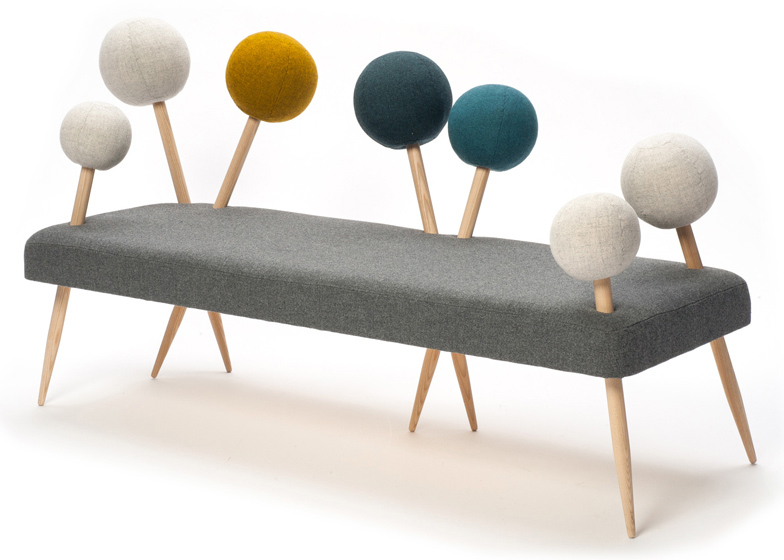 Large hand-upholstered spherical cushions top each rod to give the effect of giant pins stuck through the seat. "Walking through the classroom with beautiful sunshine coming through the windows, I discovered a new beauty in the needles sticking out of the needle pillows," said Fogarasi. "With the enlarged needles I am relating to textile techniques in an abstract way." "My main idea was to have a playful concept, what refers to the inner child in every one of us," the designer continued. "Enlarged objects by themselves generate the feeling of being little, like children." Fogarasi is studying for an MA in Furniture Design at Moholy-Nagy University of Art and Design in Budapest, Hungary, and is due to graduate next year. This project was completed while on an Erasmus exchange programme at The Royal Danish Academy of Fine Arts in Copenhagen, and Fogarasi will present the prototype at Stockholm Design Fair next week alongside other students from the school.